Making lists is one of the laziest ways of writing articles, but for some reason human nature finds the competitiveness fascinating, as well as the content being easier to digest than acres of blocky text. Awful websites like Buzzfeed have created an entire industry on insisting that "you'll never guess who number 8 is! ", but other publications such as Time's People of the Year and the Fortune 500 have shown that the genre can be done in a professional and respectable manner as well. Whatever your opinion, and even if you've already closed this page because this paragraph is too long and there aren't enough stock photos of "Superfoods That Will Actually Make You Lose Weight!" I'm going to attempt to tackle the highly contentious topic of the World's best roller coasters. Obviously this isn't like a factual listing of the ten fastest or longest roller coasters, and I'll be drawing on a number of sources. The first and foremost is the legendary Mitch Hawker Internet Coaster Poll. There are a few widespread coaster awards, but most are voted for internally and are generally disregarded (the most notable, the Golden Tickets, appears heavily biased towards the USA, and whichever park is hosting the ceremony tends to get to get a few more trophies than they may deserve). Many awards also spread themselves over numerous, abstract categories which detract from the key interesting ones. Mitch Hawker is plain and simple: there are no frills, there are two lists, one for steel and one for wooden coasters, voted for separately, and absolutely anyone who has the patience to list all the coasters they've ridden in order of preference can vote in it. Alright fine, here are some goji berries. They taste horrible and they're really expensive. Happy now? Just like the most prominent political voting systems, it has its own flaws. Quite rightly, rides which have very few riders are disregarded since there isn't a big enough sample size to give a proper judgement. However this does mean that a new ride, perhaps not in the USA or Europe, which is actually legitimately incredibly good won't get its due. This of course should correct itself in a few years though after its rider count has increased. The other, more significant issue is sentimental/malicious bias. Nemesis is quite rightly considered to be England's best roller coaster, and so when Brits visit parks overseas they (we) are often inclined to don their rose-tinted spectacles when comparing it to other rides which are ultimately far better. As a result Nemesis has rated in the top 5 in the World on five occasions now. Of course, it's just my opinion that it shouldn't, so everything has to be taken as purely subjective. The malicious aspect may sound completely ridiculous, and it is. It is rumoured that there really are petty, childish and unfortunately large groups of enthusiasts who will place a ride that would probably rank second, absolutely last, just so the ride they want to place first has a better chance to do so. The fact that everyone's full ballot form is open to viewing virtually confirms this. Similarly, there tend to be a lot of followers in large enthusiast communities who will all go along with the leaders; it's nothing malicious, it's just the nature of internet forums where discussions can lead to people's views being changed. Regardless, the pros far outweigh the cons, and it's a great list. The voting can be a lengthy process, but this serves well to eliminate those with little conviction. Simply, you list every roller coaster you've been on in order of preference, mark whether or not you've been on it in the last 12 months, and you also rank five factors: ejector airtime, floater airtime, sensation of speed, positive g force and out-of-control feeling. There are a number of websites that have prebuilt drop-down lists in order to speed up the process and get your form into the correct format. The actual algorithm used to create the overall rankings is complex, and I honestly don't know exactly how it works, but it involves analysing the individual head-to-heads between every pair of rides: so if you look at Nemesis and Maverick for example, Nemesis might rank higher on 20 out of 30 ballots, but if there are ties then it also starts to factor in relative placings, and mutual head-to-heads of both Nemesis and Maverick vs. other rides. It's fiddly, but it works. The other factors I'll be taking into consideration are my own personal ride preferences (although I haven't been on even half of the list), as well general opinions from enthusiasts and non-enthusiasts alike, and I feel I’ve weighted all three factors fairly equally. One further complication is that this list includes both steel and wooden coasters, whilst most polls separate them. As you’ll see, one type is generally considered to be clearly superior at the very top. The manufacturers' names will become pretty familiar soon enough, since there are only three in this list. First up is Rocky Mountain Construction (RMC), an American newcomer to the industry (to its top tier at least). They began life as their name suggests as a construction contractor; not designing or manufacturing coasters but rather assembling the coasters of other companies at the parks. In 2011 they began to cross over, not quite building their own rides from scratch, instead stripping the track from old wooden coasters, and replacing it with a modern, smooth steel track, often adding steeper drops and inversions - their signature is the use of completely outrageous elements that no one has dared try before: outside banked turns and sideways hills to name just two. 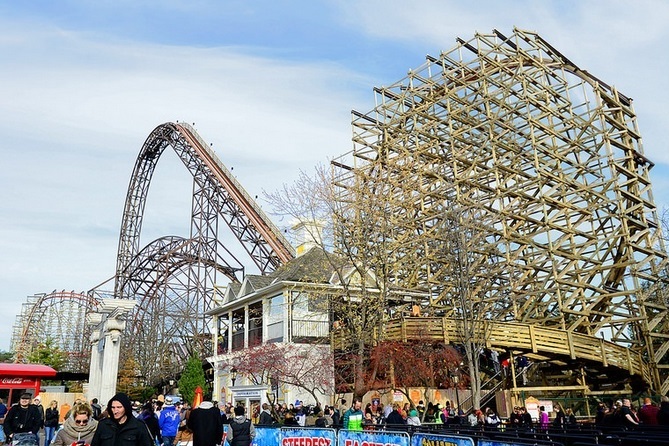 In 2013 they completed their transformation by beginning to offer a from-the-ground-up wooden coaster system, with a much thicker steel running strip than traditional woodies to improve smoothness and reduce maintenance requirements. Goliath is the second example of this model and, as of writing (September 2015), is the tallest and steepest wooden coaster in the world. Despite its impressive statistics, it's actually crammed into a tiny piece of real estate, and so the track is rather short. This hardly matters though, as Alan Schilke, the incredible chief designer at RMC, has packed the ride with as many elements as possible: after the mammoth first drop the ride doubles back on itself like a boomerang over and over, throwing in overbanks, diving loops and a bizarre stall-roll where the train rolls half way over, travels upside down briefly, before rolling back in the opposite direction. When first announced many feared that it was just too big of an ask to fit a decent layout into the allocated space, but this was dispelled on opening day. Unlike most top woodies the focus is not purely on airtime; this new generation blends zero-g with positive g force and insane inversions. *Because of just how creative Six Flags are, they've now used the name Goliath on seven completely different coasters (even using the same font for the logo), so if you've heard of "Goliath at Six Flags", and it doesn't sound anything like this, chances are it's an entirely different coaster. To be brutally honest, I felt I had to include at least one of the aforementioned stunning RMC steel conversions, and from reviews and by looks, I feel Twisted Colossus takes the crown. It's the longest; the original 1978 wooden Colossus was a duel tracked coaster, each side over 4000ft, which led many to believe that the conversion into one single track would become the longest coaster in the world (Steel Dragon 2000 in Japan currently holds the record at 8133ft). The length of track was reduced significantly from the original, but is still almost 5000ft. It had also retained the two original lift hills, so effectively offers two rides for one queue time. Each track has the signature wacky RMC style, both offering inversions and airtime, whilst being significantly different. Having opened in 2015, it hasn't seen a Mitch Hawker poll yet, and I haven't been on it either, but from the reports I've read, this thing is well deserving of a place on the list. I remember waiting for Maverick to be announced; Cedar Point's previous three major coasters had all exceeded 200ft in height: Millennium Force at 310ft in 2000, Wicked Twister at 215ft in 2002 and Top Thrill Dragster at a world record breaking 420ft in 2003. Kingda Ka at rival park Six Flags Great Adventure had stolen the height crown in 2005, and the expectation was that the ever-increasing Coaster Wars would ramp up the heat once more with a new record breaker. When I saw the concept art for Maverick, standing at just 105ft, and hitting a top speed lower than each of the three previous rides, I was pretty disinterested. As it turned out, this was the end of the Coaster Wars: the two mammoth coasters at Cedar Point and Great Adventure were received with warm but muted applause, and have both had massive periods of breakdown time, whilst Maverick became Cedar Point's most popular ride (and as you'll see later Great Adventure came up with their own alternative to reckless height and speed). The Intamin steelie is known as a Blitz Coaster, a model of which it was the first. In short, it throws absolutely everything at you. It begins with a bizarre magnetic lift hill; it's not quite a launch, but is significantly faster than a standard chain lift. This throws you into the first drop, which at 95 degrees is beyond vertical. There is then a series of incredibly fast banked turns completely flat to the ground, tossing riders side-to-side, before a single airtime hill and then two corkscrew inversions, which as a tandem have been dubbed a "Twisted Horseshoe Roll". The train then comes to a near stop before being blasted in a true magnetic launch to the ride's top speed of 70mph. Originally the ride was then built with a barrel roll directly after this launch, but during testing it was realised this would be far too intense, and it was replaced by a diving hill (this error on Intamin's part may be one of the reasons Cedar Point hasn't added a ride from them since). This hill swoops over a lake, before another section of snappy turns, ending with another airtime hill. 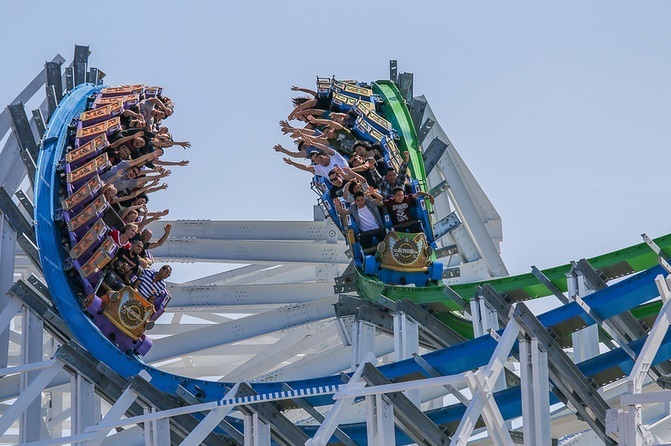 On Mitch Hawker it began in the teens before ascending to its current high of Number 6 in the most recent list, and it has set a precedent for a new breed of gimmick-free, all-rounder steel coasters. It's relentless, and does more than all three of Cedar Point's preceding rides put together. *An honourable mention goes to Liseberg's Helix, a recent version of the Blitz-style coaster, although this one built by rival company Mack. Helix on paper surpasses Maverick, and it does so in reality in many people's opinion, however I have been on it, and although I haven't ridden Maverick, Helix doesn't even reach my personal Top 10. It's a very solid ride no doubt, but for me it doesn't execute any of its assets extremely well, and it isn't particularly intense. At last we reach a ride that I've actually been on. Hersheypark, the fabulous chocolate-themed park in Pennsylvania, is my personal favourite amusement park (yes, a significant part of that is because of my love for Reese's peanut butter cups), with a lovely American midway theme, and a fantastic array of different coasters aimed at every demographic: 2012's SkyRush is the centrepiece. It is the first of the second generation of Intamin's hypercoasters; rides which are around 200ft tall and feature long series of airtime hills. The difference between the first (two examples of which feature higher up the list) and second generation is primarily structural and uninteresting: the second uses a thicker track spine which reduces foundation and support costs. The real distinguishing feature between this ride and those higher (and, it must be noted, first generation hypercoasters which don't even make the list) is the trains used. The first generation uses regular two-wide trains with lap bars, whilst SkyRush uses winged trains, where in each row of four, the two outer riders dangle off the edge. The restraints hold you in by your thighs rather than your lap/waist, and this has led a number of people to justly dub the ride "ThighCrush". I'm not usually one to complain about pain on rides, but in the front seat it did become quite unpleasant. The layout itself looks tepid, but is simply phenomenal. The rapid cable-lift hurls you into the first drop, before the ride pulls you over hill after hill, all loaded with powerful ejector airtime, launching you from your seat. Whilst my first ride, at the front, was uncomfortable (but still good), my next rides were all in the back two rows. At night, with the park illuminated, and the ride reflected in the lake it sits above, I had the very best circuit of any ride I've ever been on. But an overall ride cannot be judged on a single circuit in a single seat, and it was simply too uncomfortable at the front to rank any higher for me. It placed well in its first year in Mitch Hawker, at 7th, although this was below some other coasters I've been on which I really don't feel are as good, but it does bode well for the steel coasters higher on this list which I haven't yet been on. You couldn't have a legitimate list of the World’s best roller coasters without this first generation steel Intamin hypercoaster. The ride follows the absolute textbook procedure for building a perfect steel coaster, and it’s a surprise that there haven’t been more copies of it. It begins with a huge 221ft drop into a subterranean tunnel before three large airtime hills separated by a signature Intamin overbanked turn. After a couple of windy turns, the ride explodes into a close-to-the-ground twisting segment which again dives underground. The ride concludes with a devastating airtime finale of three bunny hops. It began life in 2000 known as Superman Ride of Steel, and ranked first on Mitch Hawker in its first year, and from 2005 to 2010, before being demoted to second. In the most recent poll it dropped to fourth, and from seeing other people’s lists it does seem it may finally be being surpassed by the younger rides. 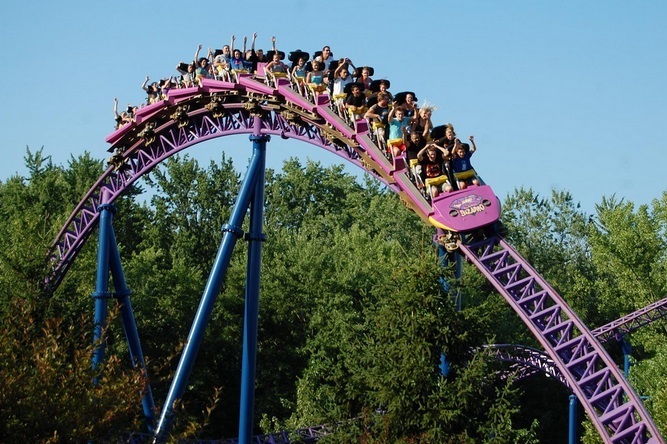 Six Flags announced that Bizarro will revert back to its original Superman handle in 2016, and perhaps with that it will reclaim some of the magic of its glory days. Either way, it's still undoubtedly one of the best rides on the planet.